Drilling near Southeast Alaska’s Herbert Glacier has yielded encouraging results for a Canadian mining company. Grande Portage Resources has been exploring claims 20 miles north of Juneau since 2010. 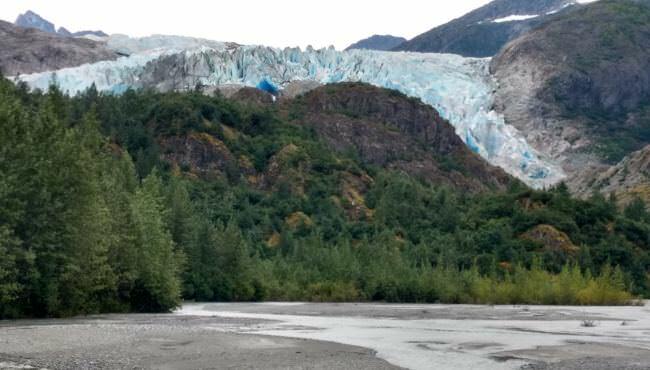 It’s an area of Juneau’s historic gold belt that’s been laid bare by the glacier’s retreat. The Vancouver-based company’s filings infer as much as $400 million worth of gold in its claims contained in the Herbert Gold Project. “We’ve got six very significant mesothermal veins that you can see from surface, and we’ve only drill-tested about 25 percent of those targets themselves,” he said. Investors’ enthusiasm over the results from this summer’s drilling caused the company’s stock price to soar, though its value has since returned to near its historic average. A similar rally occurred at the same time last year. “I think we traded north of 20 million shares since Labor Day,” Klassen said. Permission to drill has been granted by the U.S. Forest Service five times since 2010. Earlier this year, the Southeast Alaska Conservation Council asked the agency to require a comprehensive review rather than issue short-term permits. The U.S. Forest Service declined. “It would be inappropriate and unnecessary to analyze the effects of a hypothetical, future mine,” wrote Matthew Reece, the agency’s minerals program manager. SEACC staff scientist Guy Archibald said any future mine would have consequences. The claims are on federal land off of the road system. Any proposal would be still be reviewed by the City and Borough of Juneau under its local mining ordinance. Even if a mine were eventually developed, Klassen said people would hardly know it was there. Work has wrapped up for the season. Klassen said the company plans to resume exploration next summer.